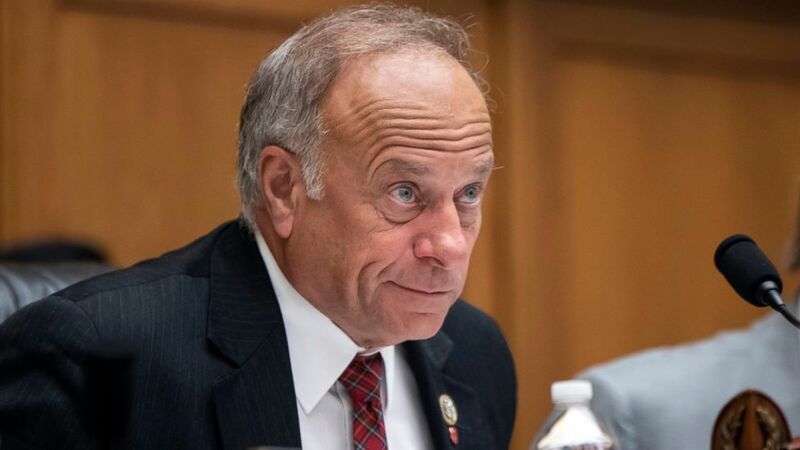 Democrats have said they've heard enough from Rep. Steve King, whose thorough record of provocative immigration rhetoric has prompted calls for Congress to formally censure the Iowa Republican firebrand. At a rally one day before the midterm elections, King was recorded in Webster City, Iowa, speaking about jalapeño peppers when he referred to immigrants as "dirt," according to The Weekly Standard. "I guess I'm going to have to go and get some dirt from Mexico to grow the next batch," King said, prompting a supporter to interject, "Trust me, it's already on its way." King then let out his latest inflammatory comment: "Well, yeah, there's plenty of dirt, it's coming from the West Coast, too, and a lot of other places, besides. This is the most dirt we've ever seen." 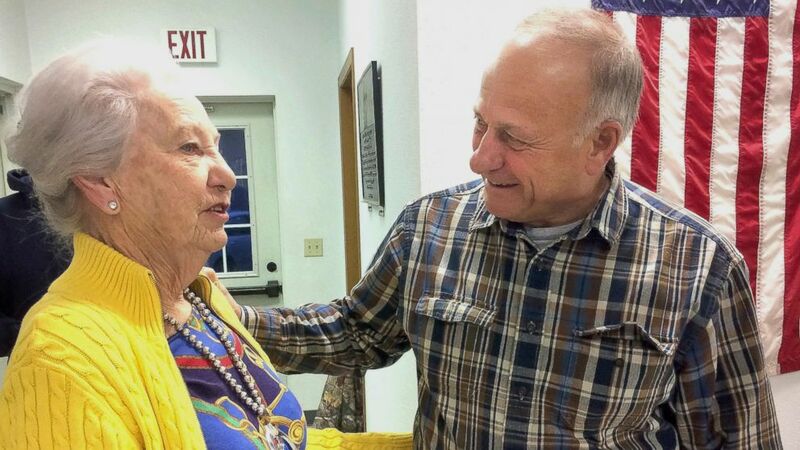 (AP) Precinct official Elaine Rex, of Odebolt, Iowa, talks with U.S. Rep. Steve King, of Kiron, Iowa, at the Odebolt Fire Station, where King cast the precinct's first vote in the mid-term election in Odebolt on Tuesday, Nov. 6, 2018. That exchange led more than 140 organizations to sign onto a letter to House Speaker Paul Ryan and Majority Leader Kevin McCarthy to censure King's "anti-Semitic, anti-immigrant, racist and homophobic" language before the end of this Congress. “Congressman King has already refuted these ridiculous claims, and views this effort as nothing more than liberal special interest groups trying to use a PR stunt to undermine President Trump’s strongest supporter in Congress,” King’s spokesman John Kennedy told ABC News. Several House Democrats -- less than 50 days from taking majority control of Congress -- told ABC News they agreed King should be censured. "The things that he says are so deeply unfair, disturbing and unbefitting of a member of Congress. And I do think that censure is appropriate," said Rep. Pramila Jayapal, D-Wash., an immigration lawyer by trade and one of 12 sitting lawmakers who are naturalized citizens. Though rare, Congress can take a number of actions to discipline its members for breaking House rules, including a fine, formal reprimand, censure on the House floor or even expulsion. Rep. Paul Tonko, D-N.Y., said he supports censure in order to restore racial unity across the country. "I would get behind any effort to make certain that we begin to heal and not continue to hurt as a nation and be divided as a nation," Tonko said. "There's a lot of healing that's required and I think leadership requires us to be those healers." (AP) In this June 8, 2018, file photo, Rep. Steve King, R-Iowa, at a hearing on Capitol Hill in Washington. A representative has not been censured since former New York Congressman Charles Rangel in 2010 after being convicted of 11 ethics violations. Before that, the last censures came in 1983 and only six congressman have been censured since 1900. King is most notorious for disparaging Dreamers in July 2013, when he said, "For every one who's a valedictorian, there's another 100 out there that they weigh 130 pounds, and they've got calves the size of cantaloupes because they're hauling 75 pounds of marijuana across the desert." "This has certainly been repetitive. It is abhorrent. It should not be tolerated," Texas Democratic Rep. Sheila Jackson Lee said. Though supportive of censure, Rep. Ro Khanna, D-Calif., expressed frustration that King's "fringe" bombast creates national attention. 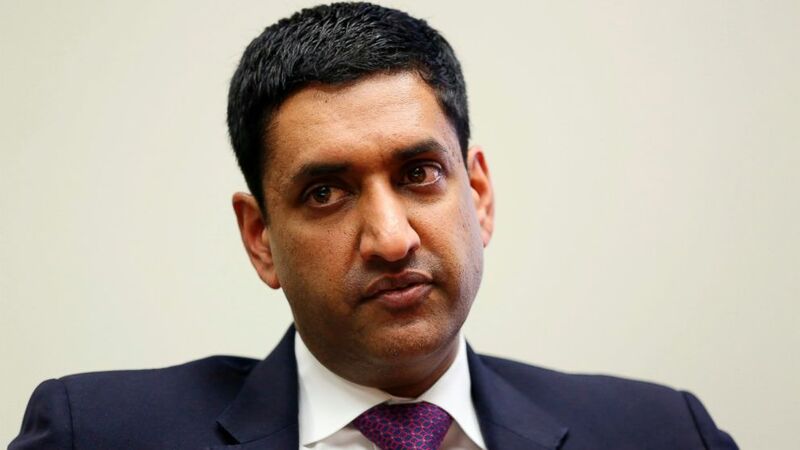 "He should be censured, but he doesn't represent America," Khanna said. "Censure him, but don't make that the topic of conversation. I mean, who cares? He's some random member of Congress who represents 5 percent of the views of the American people. That's not America." Rep. Jan Schakowsky, D-Ill., demurred on the question of censure, but tied King's rhetoric to President Donald Trump's hard-line stance against illegal immigration. "Many of us, most of us, are really disturbed with the words that [have] come out of Steve King's mouth, as well as the president's," Schakowsky said. (AP) In this file photo dated Friday, Jan. 26, 2018, U.S. Democrat Rohit 'Ro' Khanna, from California is interviewed in Los Angeles, USA. While Trump is threatening to shut down the federal government early next month if Congress does not approve $5 billion for border security by Dec. 7, Democrats insist they will not vote to keep the government open if the bill includes money for the president's long-promised border wall. "One thing I do know is we should not give a dime to this concept of a border wall," Khanna said. "I would be a 'no' vote. I don't think the wall is right. I think it fosters xenophobia and I don't think it's based on facts. I'm all for protecting our border, having border security, making sure that we're protecting our border in a way that is legal and humane. But the border wall is rhetoric that is not in the interest of this country and so I wouldn't support that." Jackson Lee said her message for Trump is that Congress will take care of border security, but she would also vote against any spending bill that funds the president's wall. "I will not support the funding of a border wall," Jackson Lee said. "I will encourage the president to get that funding from Mexico, which is what he campaigned on." King, himself a major supporter of Trump, was re-elected to a ninth term in the House in November.